The History of ACE Stamping & Machine Co., Inc.
RACINE, WI, May 17, 2015 — RC Incorporated, a family owned company that consists of the following companies: ACE Stamping & Machine Co., Inc., ACE Stamping & Metal Fab Co., Inc de Mexico, Innotec of WI, and Shakespeare Machine Stamping. Each company plays a vital role in the company’s 60 year history of creating innovative products/services such as precision metal stamping, sheet metal fabrication, adhesive tape, and abrasive components. 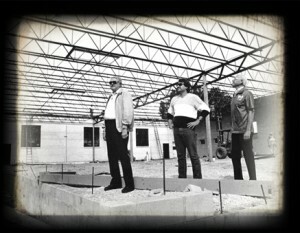 ACE’s Founder James W. Haarsma I, James’ son Ronald Haarsma, and William Tempke (Original Employee of ACE) overlooking ACE’s first building expansion in Racine, WI. All of RC Incorporated’s companies have a very humble beginning from very dedicated individuals whom put force countless hours which have allowed each company to become what it has today. However, this post puts the focus on ACE Stamping & Machine Co., Inc. as it was the founding company of the family of companies that RC Incorporated owns and operates presently. ACE Stamping & Machine Co., Inc., Racine, Wisconsin was founded in 1955 by James W. Haarsma, who at the time was the only employee. The company began in the basement of the Sattley building with one punch press and only a few pieces of tool & die equipment. James’ idea of a small precision controlled stamping company with low cost tooling, skyrocketed into what ACE Stamping has become today. After years of continual growth and expansion, ACE now has two locations internationally. The headquarters is located in a 76,000 square foot facility on the South Side of Racine, Wisconsin. This facility allows ACE to ensure the highest quality by using state-of-the-art machinery and focuses mainly on precision metal stamping. ACE’s newest addition to the family, is located in Monterrey, Mexico in a 30,000 square foot facility. This facility primarily focuses on sheet metal fabrication and final assemblies of products. For more information about ACE Stamping’s history as well as current capabilities, locations, and examples of products, please visit http://acestamping.com/.